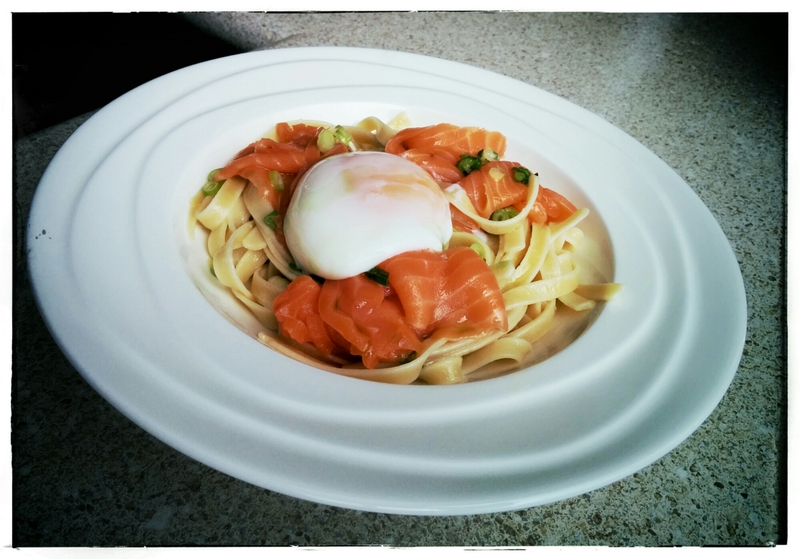 So this dish is some pasta and smoked salmon with the perfect poached egg. After trying various methods and temperature eggs, the 13 minute 75C egg method by Chef steps it is the best. I have tried tempering chocolate, and it is true for the no mess statements, but it is really scary to mess around water with kgs of chocolate at the time. Having to really dry the bag once it comes out, get your hands wet around chocolate constantly. De boning legs of lamb, split in 3 pieces, and cook with different improvised marinades for 3 hours at 57C creates really yummy, pink and awesome meat. 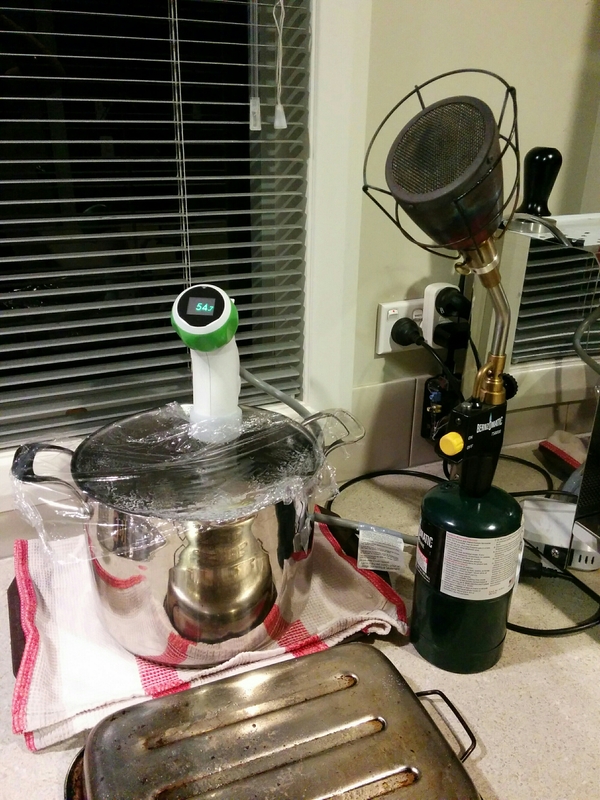 Here is new the setup, managed to get a hold of a Nomiku classic, wanted a bluetooth Anova Culinary but constantly out of stock, and annoyances in general. Do not care about wifi versions, they use cloud services and protocols that are private (there is some protocol reverse engineering for the bluetooth version though), and to be fair not that you want sort of be cooking remotely with this thing. Leaving overnight a piece of beef at the temp danger zone to be cooked the next day it is not an option, believe me. Still requires some human to be around. On the same frame my searzall torch, Yeah Baby!!!!. But wait Juan!! !, didn’t you have the PIDToolboxduino to do this, well yes, it is an awesome tool, but it is dependent on the appliances you have around, or you need to complement it with external immersion heaters (tick really insecure Chinese ones that are not sold in NZ), agitation methods (eg: noisy aquarium pumps), etc. etc, so wanted a less hustle, easy to setup solution, that means more usage! yay. I am sure the PIDToolboxduino will find its niche in smoking rigs, or some other solution that it is more hacky ;-). 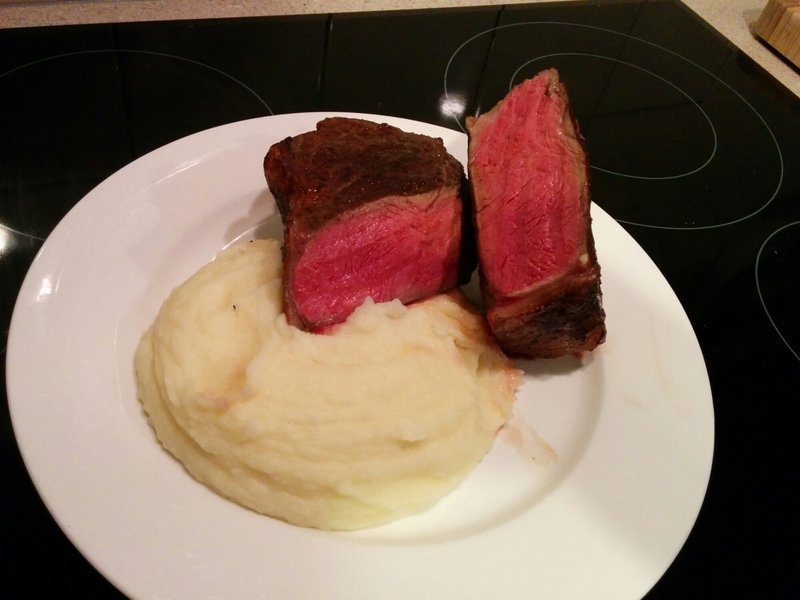 And here we have 120@55C scotch fillet, no freaking degrade!!!. Just came up with the notation I will be using from now on, 120@55C means 120 minutes at 55 degrees C.